Rob Hopkins (Founder of the Transition Town movement) is coming to Horncastle! 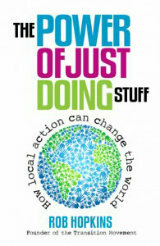 Rob Hopkins founder of the Transition Movement, author of “The Power of Just Doing Stuff – How local action can change the world”, and general good bloke, is coming to Horncastle to talk to, and with, all who care for the future. Rob will be in Horncastle on Thursday 18th July at The Stanhope Hall starting at 7.00 pm. All Welcome. A free event. Your community needs you – now, more than ever. Dear all at transitions Horncastle just been to the talk by Rob Hopkins. Thoroughly engrossing I saw that the community action that Transitions can do is very encouraging & as a member of transitions Horncastle I will endeavor to help put into practice as many of the ideas that were discussed as possible.